President George H.W. 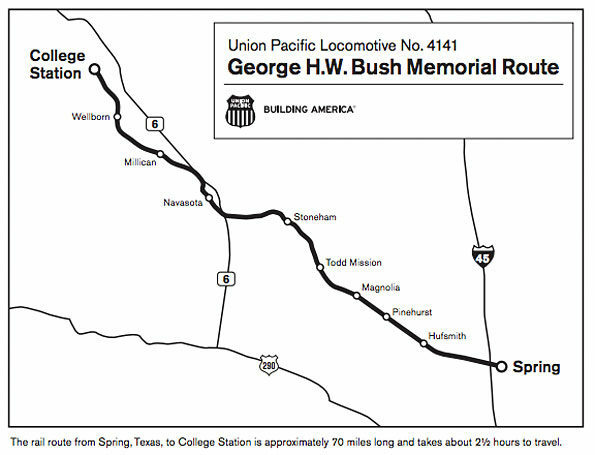 Bush to be transported to Texas A&M presidential library burial location aboard Union Pacific’s Bush 4141. Union Pacific announced Saturday that locomotive 4141 will take the president’s body from the Houston area to College Station — the home of his presidential library on the Texas A&M campus. Union Pacific is honored to participate in the funeral procession for President George H.W. Bush. The funeral train leaves Union Pacific’s Westfield Auto Facility Dec. 6 at 1 p.m. and should arrive at College Station across from Kyle Field at 3:25 p.m. The Westfield Auto Facility is not open to the public.